These are some of the observations of an evaluation of France’s 5% Initiative, a mechanism that provides technical assistance (TA) to Global Fund grant recipients. When the initiative was first launched in 2011, France withheld 5% of its contribution to the Global Fund in order to fund the initiative. France recently increased the initiative’s budget from 5% of its contribution to 7%. France pledged € 1.08 billion for the Fifth Replenishment in 2016. The evaluation was conducted in 2017 by a team of independent consultants contracted by the French Ministry for Europe and Foreign Affairs. 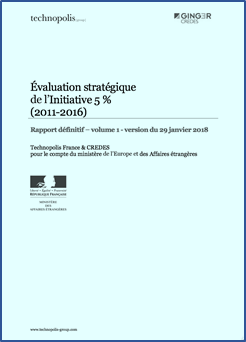 The evaluation report, which was officially released on 30 January 2018, is available here, in French. About a hundred interviews were conducted in Paris, France; Geneva, Switzerland; Burkina Faso; and the Democratic Republic of Congo. An electronic survey for Channel 2 recipients, an analysis of internal documentation and reports from other technical support facilities were also used to collect data. The 5% Initiative has two streams (known as “channels”). Channel 1 provides short-term TA, which involves sending TA providers and other experts to recipient countries. Channel 2 funds longer-term projects submitted by stakeholders such as NGOs and research institutes. These projects respond to programmatic needs or structural issues in Global Fund beneficiary countries. The recent announcement of a call for proposals from the 5% Initiative, which Aidspan reported, was a Channel 2 project. The countries eligible for assistance from the 5% Initiative are the priority countries of French official development assistance, countries emerging from crisis situations, and member and observer countries of the International Organisation of La Francophonie that receive official development assistance –– a total of 55 countries (although a sub-set of these countries receive the majority of assistance). Two of the main recommendations of the evaluation were that the initiative should benefit more from the lessons learned from its outcomes and should do more to promote the visibility of France. The evaluation also called for a “better structured operational implementation,” particularly in light of the increase in funding for the initiative (from 5% to 7% of France’s contribution). The evaluation found that the initiative’s Channel 1is particularly relevant to deal with the absorptive issues in French-speaking countries in sub-Saharan Africa. It said that two of the main strengths of this channel were that it was responsive to country needs and that the needs were well defined by recipients. However, the evaluators also found that the absence of prioritization among requests for TA and among recipient countries creates confusion for many stakeholders and increases the workload of the 5% Initiative’s secretariat, especially during the time when recipient countries are preparing funding requests. The evaluators recommended that there be a better balance between the demand-driven aspect of Channel 1and what can be effectively and efficiently managed. They recommended the initiative focus on a more limited set of countries. The evaluation found that Channel 2 allows the initiative to respond to multiple issues faced by countries and to test innovative approaches. In the electronic survey, Channel 2 recipients declared that the issues targeted by the calls for proposals are in line with the capacity building needs of implementers. However, the evaluators said the strategic framework of Channel 2 should be clarified to make the channel more understandable in the field. In addition, the evaluation highlighted the need to simplify processes and improve the disbursement rate through a stronger focus on management and financial capacity in the selection of recipients. The evaluators suggested several ways in which Channel 2 could be improved, including by focusing on a smaller number of projects and by working with the Global Fund to promote the scale-up of the outcomes of Channel 2 projects. The evaluators also suggested that consideration be given to creating a separate channel to fund operational research. The evaluators compared the 5% Initiative to other similar mechanisms such as Grant Management Solutions (this project is now ended, see GFO article), the Backup Initiative, and the UNAIDS regional TA facilities. The evaluators said that coordination among the various TA mechanisms needs to be reinforced, especially at the operational level. The evaluators said that oversight of the 5% Initiative was too onerous and time-consuming, and should be simplified by, among other actions, reducing the number of meetings of the Steering Committee and delegating more to the initiative’s secretariat. The evaluation recommended that to facilitate oversight and improve consistency, the initiative’s terms of reference should be updated and linked to a performance framework, complete with indicators. The evaluators also recommended that the complement of staff be increased. From 2011 to 2016, 280 missions have been implemented (around 60 per year) totaling € 22.2 million –– 23% of the 5% Initiative’s budget over the period. These missions target mainly health system issues (47% of the missions) such as national disease program strengthening, support to national health information systems, and improvement of drug procurement and supply management. Support for country dialogues and applying for funding represented 28% of the missions. In terms of geographic area, 47% of the missions are deployed in West Africa, 18% in Central Africa and 15% in Asia. Of the funds spent, 33% benefited country coordinating mechanisms, 26% principal recipients, 21% sub recipients and 20% others (such as national programs, health ministries, public procurement agencies, local NGOs and regional organizations). From 2011 to 2016, 69 projects have been granted for a total amount of € 79.4 million, 63% of the 5% Initiative’s budget. Through Channel 2, the projects funded target mostly HIV (50% of the projects). Other projects dealt with health systems strengthening (29%), malaria (12%) and TB (9%). Projects are led and implemented by four types of stakeholders: international NGOs (46%), research institutes or universities (23%), local NGOs (18%) and public organizations (13%). In terms of geographic area, 64% of the projects are deployed in West Africa, 15% in Central Africa and 12% in Asia (but many projects concern multiple countries and are difficult to classify).